Home / ACT • Australia • Australian Capital Territoriy • Firearm Safety • Hunting • Labor Party • Mick Gentleman • Suppressors / Public Safety: A feeble excuse in the A.C.T, not a result. Our ACT Representative asked ACT Police minister Mick Gentleman to provide an explanation on how some of the laws in the ACT benefit public safety and evidence that would support these gains. It only took 3 months and a request to the Shadow Minister for Police and Emergency services to raise the issue with the Minister to get a response, and to say that it is underwhelming is an understatement. 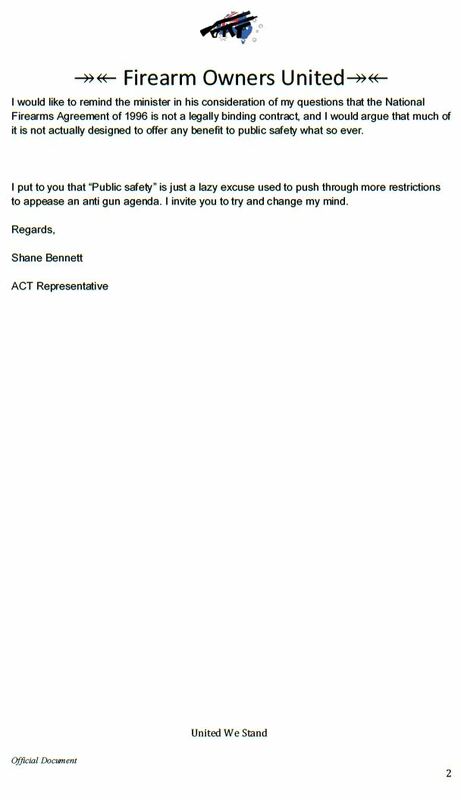 Reviewing the response given to us, it is glaringly obvious that the ACT Labor Police Minister and possibly his staff have absolutely no respect for lawful firearm owners, or for evidence-based policy. Some of the idiocy expected of Gun Control Australia taints much of this response as well. We have been informed that the appearance laws are highly controlled because of the potential for the use of a gun that appears fully automatic to be used in a crime, and may cause a “disproportionate response” by police, security, and the public. I don’t know about you, but if a bloke with a balaclava walks into the 7-11 while I’m paying for fuel and puts a barrel to my head, it’s brown trousers time, particularly as a lawful citizen as I don’t carry the means to defend myself. I don’t care if it’s a MAC-10 or a single shot .22 rifle. And I sincerely hope that the police take my concern as seriously as I do and kill him before he kills me. *Cop responds: What are they armed with? *Police Radio: A gun that doesn’t look like an automatic. *Cop again: Pfft. I’m on smoko. We’ll get there in time to take a statement. 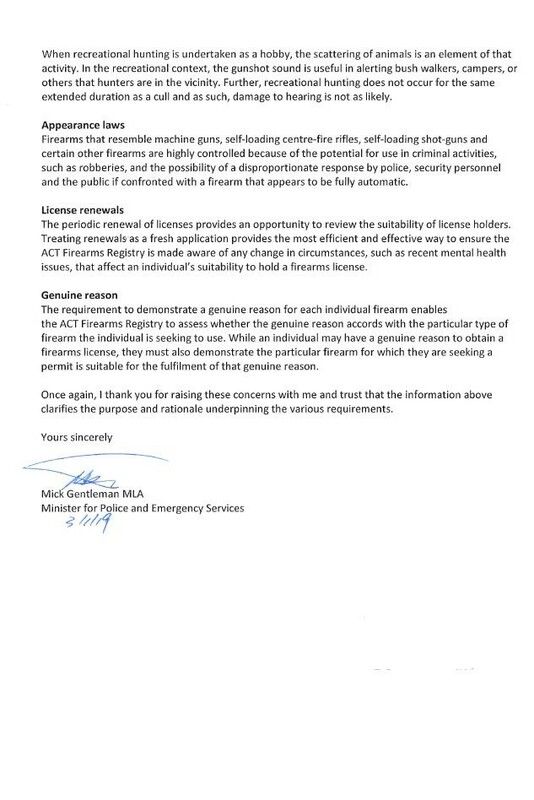 We questioned why a firearm license renewal in the ACT is treated as a new application. Apparently, this is to provide an opportunity to review the suitability of license holders. Apparently, the cancellation of a firearms license when a license holder commits a crime or is otherwise found to be legally unfit is too inefficient. This is also the most efficient and effective way to make the registry aware of any change in circumstance such as mental health issues. Because advising the registry if you have an issue immediately, or just ticking a box on a renewal slip (rather than filling out the 6 page document) is just too cumbersome. Never mind that in Western Australia, home of possibly the most draconian laws in Australia, it is just a case of paying the renewal. 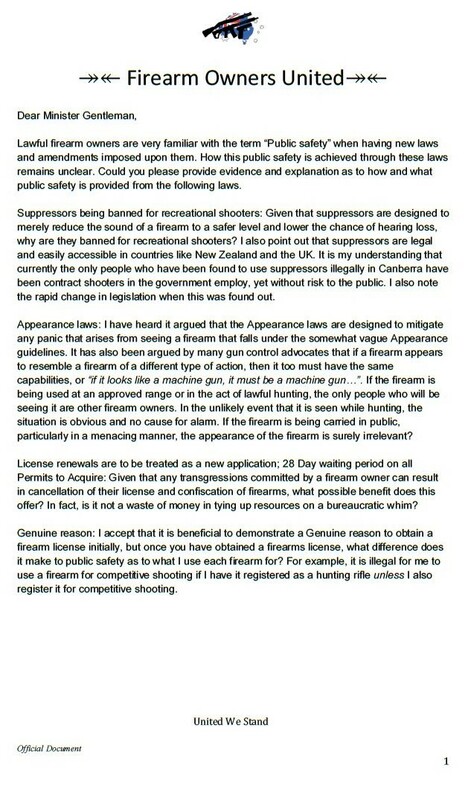 On the issue of the “genuine reason” clause for the registration of a firearm, the question was basically regurgitated as a statement. There was no attempt to explain what possible public safety benefit there is to impeding a recreational hunter from competing in target shooting without it being on their license. Are there concerns that a hunter might suddenly get hunting flashbacks, develop that 1000 yard stare, and start stalking anyone not wearing blaze orange? Or that a target shooter who decides to try their hand at hunting will be involved in animal cruelty by trying to patch the hole on an animal and shoot it again? Possibly from very far away? Who knows? I’m quite sure that Minister Mick Gentleman doesn’t. 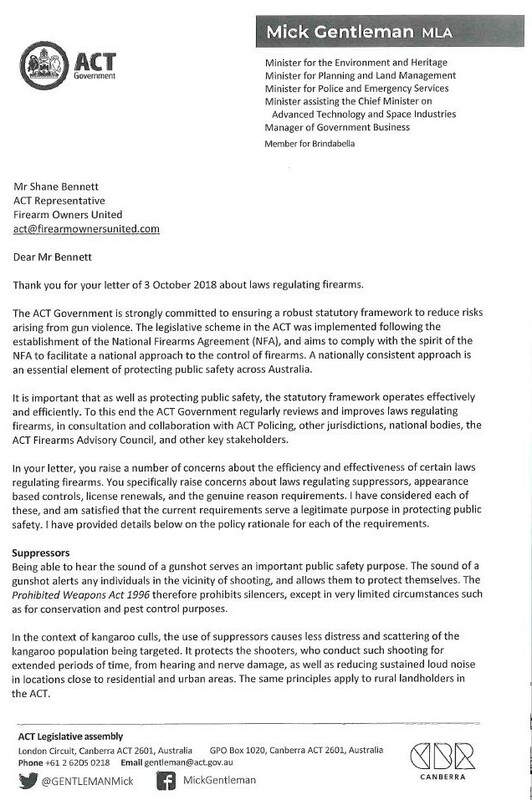 In fairness, the response we received was not the cut and paste response typical of politicians when firearm issues are raised with them, and actually appears to have the Minister’s signature on it which suggests that he might have actually seen it before it was sent. It’s almost possible that he even wrote it, scary as it is that the person responsible for the legislation in question couldn’t even answer a few questions about it. You can read our letter, and the response from the Minister below. Apparently safety is something you can have if you can afford to pay for the guards or the public will provide the guards for you – the rest of us just take our chances.